Bull kelp can grow to 30 to 60 feet in length from a long brown stem at the sediment secured by holdfasts to a large bulb floating on the sea surface with long blades growing from the bulb to create a forest canopy. It looks like a bull whip, thus the common name bull kelp. The kelp prefers the rough and tumble ocean conditions, providing essential habitat for fish, sea stars, sea urchins and snails. 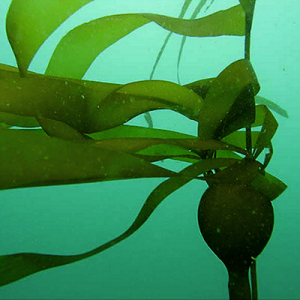 In Washington State bull kelp aquaculture has focused on restoration.